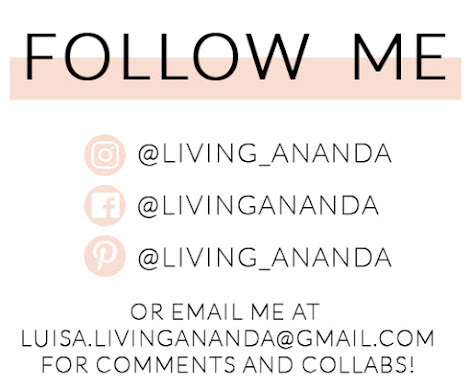 So for my first recipe post, and as a special treat for those of you who are reading my blog (thanks you guys!) I am sharing TWO recipes. 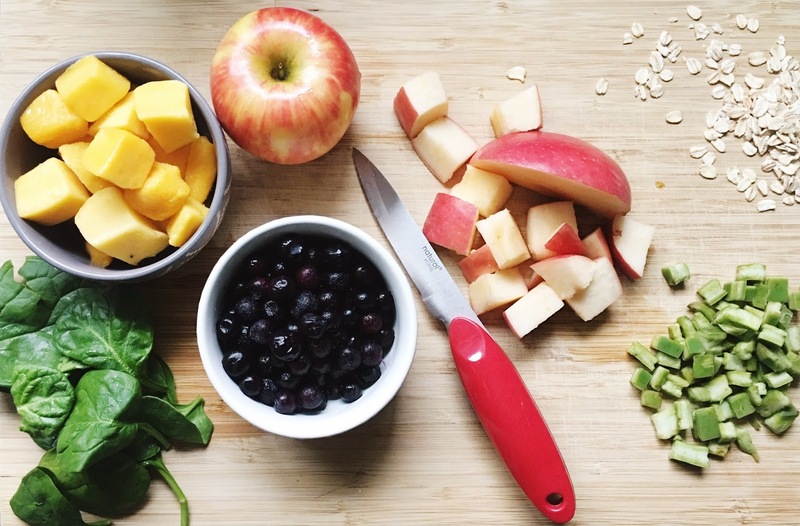 I will start with two super delicious and very spring-y smoothie recipes! Pretty much since elementary school, my usual breakfast would consist of a smoothie. Mainly because I eat terribly slow, like a turtle falling asleep. So after taking a long time to get ready before school, my mom had the greatest idea: let's make Luisa a smoothie and save ourselves some good 30 minutes waiting for her in the car honking endlessly. And guess what? I loved it. 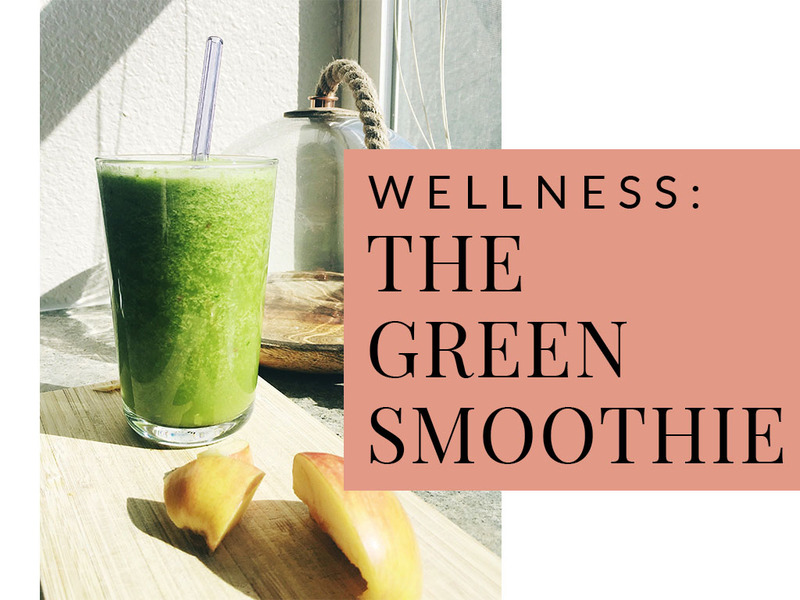 Before we used to do our smoothies in the blender, but now, since the magnificent invention called Nutribullet and all of those single serving blending things, it is easier for me not to go overboard and make smoothie for an entire neighborhood at one time. So if you have one, good for you, I would add stuff in there until its filled to the max line and then fill the rest with water. But if you are using a blender, I have included here an approximate measure of how much I use of each ingredient, you can use it as a guide, but honestly if you don't like something or would like to add something else, I would say go for it! Food is to be enjoyed so if you are doing something healthy at least you can make it enjoyable. I love strolling around with my cart in the produce section, it just makes me so happy to see all the different colors and textures, really, we take them for granted but have you ever thought about how amazing fruits and veggies are? And as a little thank you to our Mother Earth, I have been using my reusable veggie bags from Natural Home Brands for a while and I love them! If you want to get yours and look at their other amazing products you can click here. We are actually hosting a giveaway together to win a set of veggie bags and some other products to help you when prepping your fruits and veggies. The winner will be announced on Instagram March 28th so stay tuned! This first recipe is the one my mom used to make for me when I was in school, it is super easy to make, very nutritious and it really makes me feel full for a long long time. It has oatmeal, which helps lower cholesterol levels and helps lower the risk of cardiovascular disease. I know this because my grandma has heart problems and the doctor recommended this smoothie for breakfast to help her get that under control. The apple and banana are of course super good for you, have a bunch of vitamins and minerals and the flavors mix so well with the oatmeal. Originally my mom prepared this one with cow's milk, but now that I don't drink it I make it with soy milk (I can't stand almond milk) and it tastes just as great. I don't make this one as often now but there are some times that I feel like I want something sweet and creamy in the morning and this smoothie hits the spot. 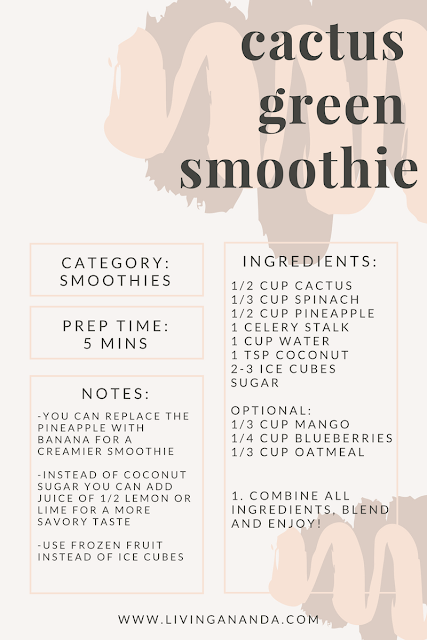 Now, the second recipe I'm passing on to you, comes after a smoothie my parents discovered some time ago at a smoothie bar. Later my mom started doing them at home, and that is how I go introduced to it. Originally, I thought it was gross because it had cactus in it, even though I hadn't tried it before. The benefits of cactus are basically endless, it helps to loose weight, improve digestion, aids in the prevention of cancer, boosts metabolism, a bunch of things. It wasn't until I tasted it on a dare that I discovered that: 1. Cactus don't taste like I thought it would, and 2. I love cactus. Now, after many years, this recipe has evolved. Originally, it consisted of basically orange juice (freshly squeezed) and cactus, and maybe a Splenda packet (shocker I know, that's back when we thought it was healthy), but now I usually add more than one fruit but it is not necessary because it still tastes great. The only thing I would say is to drink it right away because it starts to separate and you get something like a juice at the bottom and the rest sits on the top and it doesn't look very appetizing. 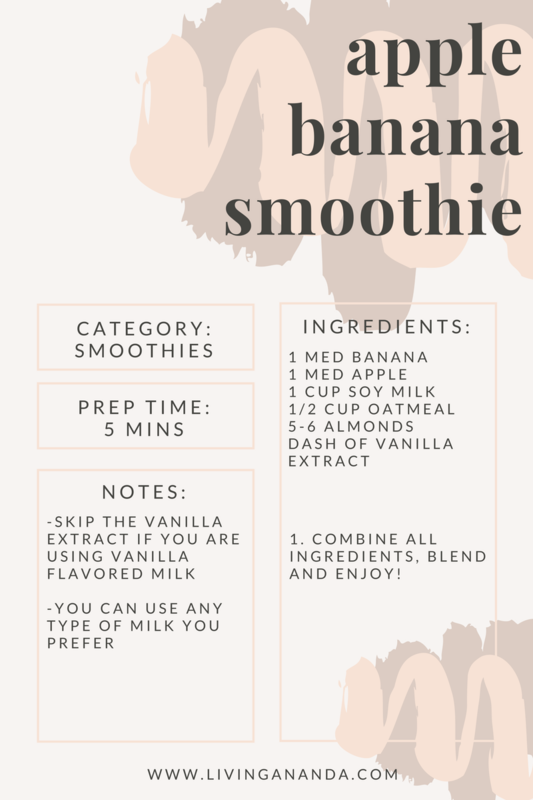 What is your favorite smoothie flavor? Let me know in the comments and tell me how it went if you tried mine out!